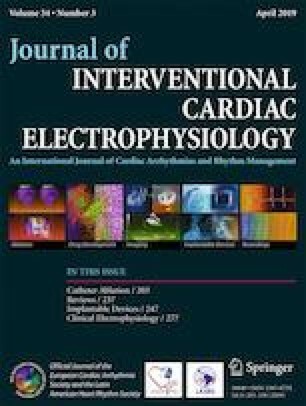 Patients with severe cardiomyopathy often have chronotropic incompetence, which is predominantly managed by activating rate-adaptive pacing in patients implanted with an implantable cardioverter–defibrillator (ICD) capable of atrial pacing. The purpose of this study was to determine predictors of rate-adaptive pacing activation, the cumulative incidence of activation, and the association of rate-adaptive pacing activation with subsequent clinical outcomes in an ICD population. The authors evaluated 228 patients implanted with an ICD between 2011 and 2015. Multivariable logistic regression was used to evaluate predictors of rate-adaptive pacing activation. Cox proportional–hazards regression was used to examine associations of rate-adaptive pacing activation and clinical outcomes. Rate-adaptive pacing was turned on in 38.5% (n = 88) of patients during follow-up. Several statistically significant predictors of rate-adaptive pacing activation were found, particularly previous atrial fibrillation (odds ratio [OR] = 8.27, 95% confidence interval [CI] = 2.96–23.06, p < 0.001), previous myocardial infarction (OR = 4.17, 95% CI = 1.38–12.58, p = 0.01), and non-ischemic cardiomyopathy (OR = 3.83, 95% CI = 1.22–12.00, p = 0.02). In multivariable adjusted analyses, rate-adaptive pacing activation within 30 days of implantation was not associated with the risk of device therapy for tachyarrhythmias (hazard ratio [HR] = 1.52, 95% CI = 0.71–3.28, p = 0.29), atrial fibrillation (HR = 1.42, 95% CI = 0.71–2.87, p = 0.32), HF re-admission (HR = 1.39, 95% CI = 0.80–2.43, p = 0.25), nor all-cause mortality (HR = 2.34, 95% CI = 0.80–6.84, p = 0.12). During follow-up, more than one in three HF patients implanted with an ICD developed the need for rate-adaptive pacing. Atrial fibrillation, prior myocardial infarction, and non-ischemic cardiomyopathy were statistically significant baseline clinical predictors of rate-adaptive pacing activation. Rate-adaptive pacing activation was not associated with subsequent adverse clinical outcomes. Ethical approval for this study was granted by the UCSD Institutional Review Board. The UCSD Cardiac Electrophysiology Fellowship Training Program receives support from Medtronic, Inc., St. Jude Medical, Inc., Biotronik, Inc., Boston-Scientific, Inc., and Biosense-Webster, Inc.
Dr. Jonathan C. Hsu reports receiving honoraria from Medtronic, St. Jude Medical, Boston Scientific and Biotronik and research grants from Biosense-Webster and Biotronik. Dr. Gregory K. Feld, Director CCEP Fellowship Training program, receives fellowship stipend support from Biotronik, Inc., Medtronic, Inc., St. Jude Medical, Inc., Boston Scientific, Inc., and Biosense Webster, Inc. The UCSD Human Research Protection Program approved analysis of the data from our institution for this study. Owing to the retrospective and observational nature of this study, written informed consent was waived. Olshansky B, Richards M, Sharma A, Wold N, Jones P, Perschbacher D, et al. Survival after rate-responsive programming in patients with cardiac resynchronization therapy-defibrillator implants is associated with a novel parameter: the heart rate score. Circ Arrhythm Electrophysiol. 2016;9(8). https://doi.org/10.1161/CIRCEP.115.003806.